Essentially, I am dealing with effects of agents of growth and decay and how these agents shape and embellish the surfaces of stones and the skins of trees. These agents also serve key roles in interacting with my ceramic vessels. Mushrooms, seed pods, grubs and other growths serve as knobs and handles, allowing one to remove lids and discover what might be inside or underneath a covered vessel, like lifting a rock to have insects scurry in many different directions when subjected to the light of day. The vessels are not intended to be actual representations of the trees and rocks, but abstractions and stylizations of these natural phenomena. Employing an earthy background palette stretched across textured but quieter surfaces, I wanted to upset that quiet earthiness with intense splashes of vibrant color, patterns, and glossy surfaces not commonly associated with tree bark or the rough surfaces of rocks amidst fallen leaves. I am interested in inflated volume and thick line qualities that reference comic style drawings and how that can apply to interpreting the natural world. With my ceramic vessels I hope to create a comic book interpretation of the natural world with a focus on the rocks and trees and their role in the perpetual organic comedy of growth and decay. Biography I grew up in Poplar, NC, a small community deep in the mountains of western North Carolina. I attended the University of North Carolina at Chapel Hill and in 1996 received a Bachelor of the Arts degree in Anthropology, with a minor in Folklore. My interest in Folklore led me to John C. Campbell Folk School in Brasstown, NC, where I took classes in ceramics and other media. 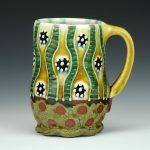 After working for two years with two potters near Asheville, NC, I attended Penland School of Crafts. 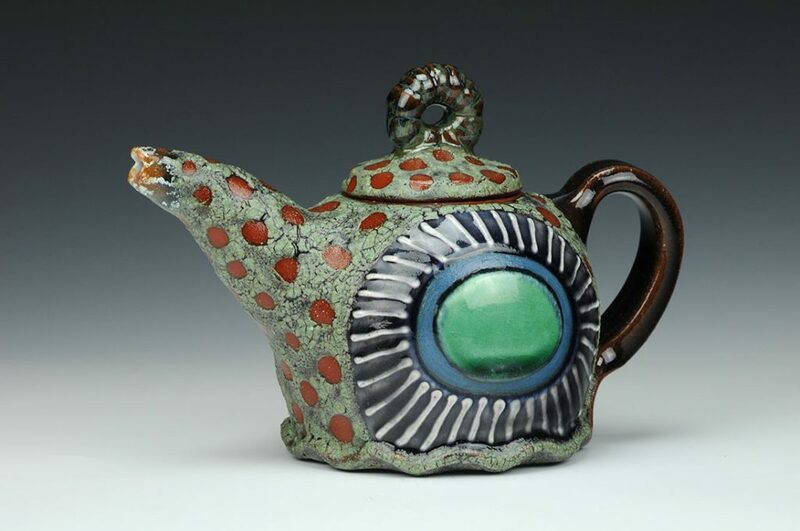 Initially, I intended to stay for a two month Concentration in Wood and Soda Fired Pottery with MacKenzie Smith, but after the workshop and falling in love with the community and the school, my two months turned into four years. After Concentration, I applied for and was accepted into the Core Student program. During the two-year intensive work exchange program, I was fortunate to study with a number of internationally known artists and craftspeople. 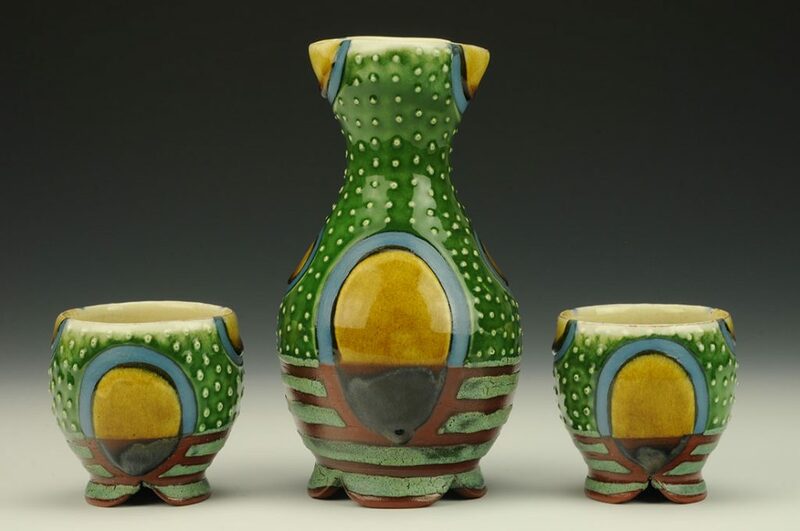 Currently, I maintain Nine Toes Pottery, a ceramics studio in Chapel Hill, NC, which produces highly decorative and functional earthenware vessels. My work is drawn from processes of growth and decay in the natural world and translated into a ceramic comic book interpretation of both real and imagined phenomena. 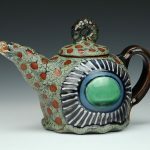 I have shown in local and national exhibitions, including the 2008 Strictly Functional Pottery National in East Petersburg, PA. 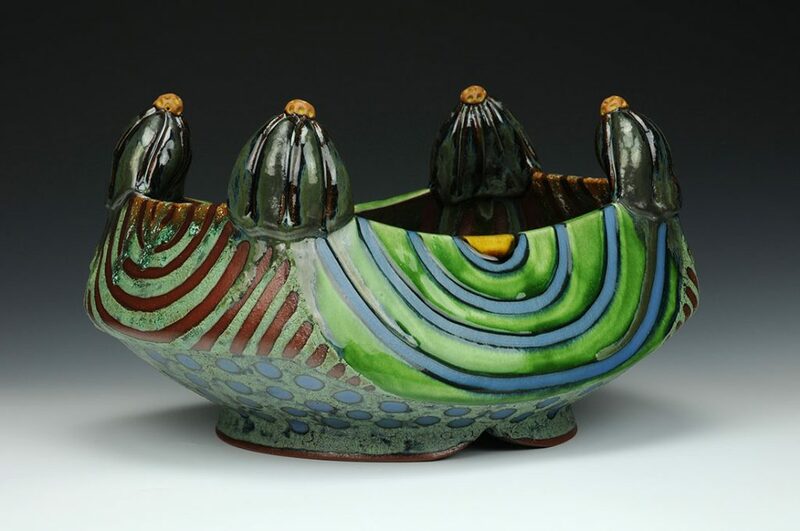 I was also invited to participate in the 4th, 5th , 6th, 7th, 8th, and 11th Annual Potter’s Market Invitational at the Mint Museum in Charlotte, NC, which includes some of North Carolina’s most talented ceramic artists and potters. My work has been featured in both Ceramics Monthly and Clay Times, and the books 500 Bowls and 500 Plates and Chargers, which includes an image of my plates on the back cover. 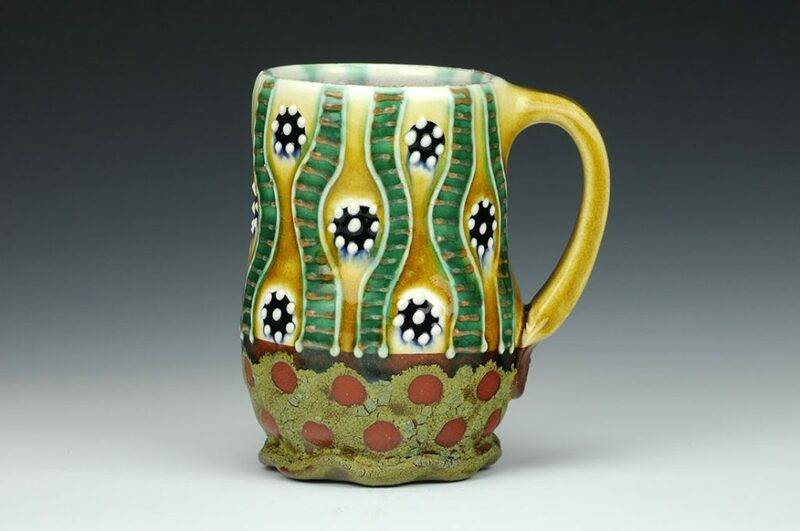 I have pieces included in the Permanent Collections of the North Carolina Pottery Center in Seagrove, NC and the Governor Morehead School in Raleigh, NC. Recent exhibitions include solo shows at the Kiln Gallery in Fairhope, AL, Mudfire Gallery in Atlanta, GA, Charlie Cummings Gallery in Gainesville, FL. 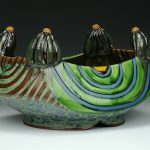 I taught for 10 years at local craft centers and ceramics studios in the Chapel Hill/Raleigh/Durham area of NC, and I recently led workshops throughout the Southeastern United States, including at Penland School of Crafts, Arrowmont School of Arts and Crafts, Mudfire Studio, and the Kiln Studio. Join the Triangle Potters Guild! Interested in joining the Guild? Find out more by clicking here! Schedule a TPG Demo! 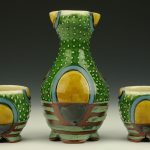 Click here to request a demo by a Triangle Potters Guild member.